People in meetings understand only 10% of what they hear .. but 50% of what they see and hear ! Stylish whiteboard and corkboard in one. The perfect combination when space is limited. Aluminium frame with rounded corners for concealed wall fixings (supplied). Makes your board more individual ! We offer free delivery to Sydney Metro for all whiteboard purchases. 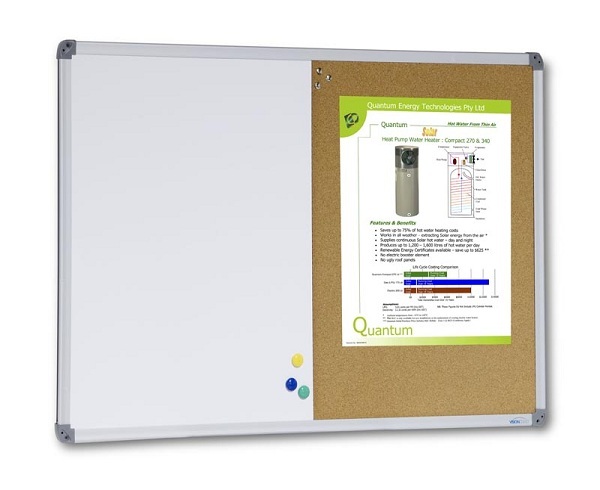 All our whiteboards are a stock items and can be delivered next working day. Our Mobile boards are Australian made with high quality materials and backed with an 8 year warranty.